Donnie and Amy grew up in different parts of the country, Donnie in Fayetteville, AR and Amy all over the South. She lived in Arizona, Texas, and Arkansas. God, in His sovereignty, brought them together while they were attending the same church in college. They were married in 1998 and the Lord has blessed them with three wonderful children. Titus is 11, Anna is 8, and Christian is 6. Donnie has served in ministry since 2000. 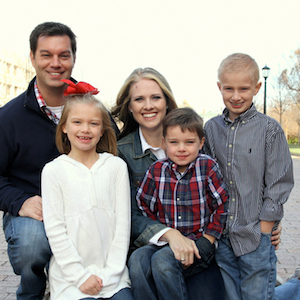 He has served as Student Pastor for 8 years in Arkansas, Florida, and Texas. Most recently has served these past 6 years as Executive Pastor at a church in Texas. Donnie has earned a Bachelor of Science in Business Administration from the University of Arkansas and attended Southern Seminary. While serving as Executive Pastor, the Lord began to stir the waters in both Donnie and Amy about planting a church. The Lord has brought them back to Northwest Arkansas to plant a Gospel-centered and multi-cultural church that displays the love of Jesus to everyone. Donnie and Amy are excited to see what God is going to do in NWA. They feel so blessed to be a part of this incredible calling to lead others to a relationship with Jesus Christ.